What is your hope in Heaven actually mean? Dr. Reagan: I've noticed when I go to Christian groups all the time what happens when I get up and ask, "What is your hope as a Christian?" that nearly always they will respond, "My hope is Heaven." But, "What exactly does that mean?," I'll ask. Why, there's just total silence as nobody knows how to answer. Where is Heaven? What does it mean to go to Heaven? Are you going to have a body? Are you going to be recognizable? Are you going to know people? The people respond, "We don't know." And yet, the Bible answers these questions for us. So, what are some of the specifics about our future hope? Nathan Jones: I love this verse! First Corinthians 2:9 reads, "However, it is written, no eye has seen, no ear has heard, no mind has conceived what God has prepared for those who love Him." But, the Bible does give us hints about just what that future is. Dr. Reagan: And, the very next verse says, "God has revealed those things to us through His Spirit." So, the descriptors are there, but people don't know what they are because they haven't heard the preaching on Bible prophecy. Dennis Pollock: Actually, Heaven is what we call the great eternal city — New Jerusalem. It's where God is. It's where Christ is. The Bible not only tells us about it, but it also tells us there will be a time when there will be a new heaven and a new earth. This New Jerusalem will merge with this restored earth and this will be our home base forever. You're right, a lot of people don't get very specific about Heaven primarily because they don't take the biblical descriptions that are written and believe they will literally be the case. 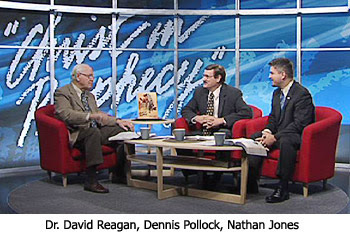 Dr. Reagan: I think most Christians have an ethereal view of Heaven. Their idea is they are going to be floating around on a cloud playing a harp in an ethereal world, maybe where they are kind of merged with the God of the universe, kind of a Hindu concept of the spirit being merged with the universal spirit. But, the Bible says, no, we're going to have tangible, perfected bodies. I'll have some hair. My knee won't hurt me anymore. We're going to have perfected bodies. We're going to live on a new earth that's refreshed and redeemed. We'll I've in the New Jerusalem in the presence of Almighty God, forever and ever serving Him. I can get excited about that! Nathan Jones: Think about how long the Lord has been working on the New Jerusalem. John 14:2 tells us, "In my Father's house there are many rooms, if it weren't so I would have told you. I am going there to prepare a place for you." Now, if it took six days to create the Universe, and Jesus has been working on the New Jerusalem for 2,000 years, then it's going to be just incredible. That's going to be our home base for the foreseeable future. Dr. Reagan: I find that quite often since Christians don't know really what's going to happen, well how can you get excited about something you don't know anything about? How can you get excited about a surprise birthday party? You can't. How can you get excited about the coming of the Lord if you don't know what's going to happen when the Lord comes? The more I study Bible prophecy the more excited I get about what is coming. Instead, most Christians are clinging to this wretched world that we live in. They're clinging to it as if it is all we've got. Nathan Jones: It reminds me of my old track and field days. I used to be a runner and sometimes the coaches would move me from a sprint into a long distance race. The long distance race meant you had to at least go a quarter mile around the track. It's agony for a sprinter to have to do that. You can't see the finish line, and so as you're running you are thinking, "It's never going to come, it's never going to come." But, once you came around that last turn and you see the finish line, hope would spring to life and everybody running started going faster when there's a destination in sight. When that destination seems like it's never appearing, and we don't know what the result of our exertions will be, then we are not excited about running that race. But, when we know what our destination is, we know that the race thank goodness is finally done and possibly there's a medal waiting at the end of it. Knowing and seeing where one is going gives us hope and a bright future, and that's what Heaven provides for us all. Dr. Reagan: And, only when you look at the specifics, and in fact the Bible does give specific details concerning our eternal destiny. Dennis Pollock: The Church a lot of times wants to throw out the details and just concludes, "Let's just sum Heaven up by saying it will be good and we will be happy." But, no, there are tremendous details. When you look ahead and you read what God has said, and you begin to believe it, it makes a tremendous difference in the way that you live right now. I have to share this quote from C.S. Lewis. He believed Heaven will be better than any of us could ever imagine. He said, "If you read history you will find that the Christians who did the most for the present world were those who thought the most about the next world." He also said, "The Apostles themselves who set foot on the conversion of the Roman Empire, the great men who built up the Middle Ages, the English evangelicals who abolished the slave trade — they all left their mark on the earth precisely because their minds were occupied with Heaven." He observed, "Since Christians have largely ceased to think of the other world that they have become ineffective in this one." Lewis left us with this advice, "Aim at Heaven and you'll get the earth thrown in. Aim at the earth and you'll get neither." In the last part of this series on looking forward with hope, we'll share how you can become an heir of hope. I agree with the article,with one exception. I respectfuly disagree with The statement made concerning Earth being "restored",I:E, made new. Quote;"This New Jerusalem will merge with this restored earth and this will be our home base forever." The following scriptures refute such a summation. Please take note of the words FERVENT,DISSOLVED,PASS AWAY,ELEMENTS,FIRE and BURNED UP.